Overall, at 3.5 out of 5 stars, GNC Ultra 25 Probiotic Complex is an above average probiotic. I really like the ease of use with this probiotic. You only have to take one capsule a day with food. The directions do suggest that if you’re lactose intolerant, traveling, or taking antibiotics, that additional servings may be beneficial. 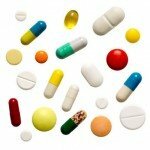 The capsules come in incredibly convenient blister packs that break apart into individual sections. I love this! You also don’t have to refrigeration these capsules, making them much more stable. I also really like that this product is very allergy friendly. 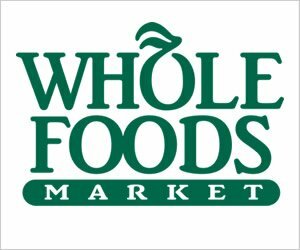 It’s free of all the major allergens, which is a huge advantage to those of us with particular stomachs or food allergies. Ultra 25 Probiotic Complex also uses a solid probiotic strain profile that has been researched quite a bit. On the downside, there are a few areas that I didn’t like about this probiotic. It’s definitely more expensive than your average daily probiotic. I would’ve liked to see the price be lower, but I do think it’s still a good value. Another thing that I didn’t like was that I did get side effects while first taking this supplement. I got a stomachache for the first 2-3 days, which wasn’t fun! That may be a result of the extremely high CFU count at 25 billion. A count that high is better suited for short-term use for a specific ailment, not a daily use probiotic. Overall though, I thought this product was above average since it’s so convenient, allergy friendly, and has a good strain profile, as long as you can get past the higher cost and side effects. GNC Ultra 25 Probiotic Complex has 25 billion cells in 4 different probiotic strains. This is a tried and true probiotic that has been researched quite a bit. 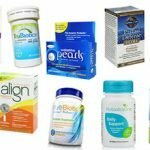 It has been shown to potentially help with digestive disorders and belly pain that are associated with Irritable Bowel Syndrome (IBS), diarrhea, constipation, irregularity and gas. Lactobacillus acidophilus may also be able to help treat vaginal infections, lactose intolerance, and asthma. Another strain used that I like is Bifidobacterium bifidum. 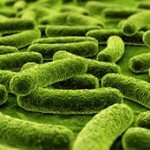 Bifidobacterium bifidum may be able to help with overall inflammation of the body and help boost immune function. Some additional benefits of Bifidobacterium bifidum is that it might help balance out the bacteria levels in the body, fight yeast overgrowth, and combat E. coli infections. 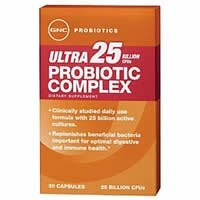 GNC Ultra 25 Probiotic Complex doesn’t seem to have any allergy concerns. Big props for being so allergy friendly! The other ingredients in these capsules include: gelatin, cellulose, silica, magnesium stearate, and titanium dioxide (natural mineral whitener). For 30 capsules, it costs $34.99. This works out to be $1.16 a day to take this probiotic. Anything over $1 a day is definitely pricey and this probiotic is no exception. I would’ve liked to see a less expensive price, but I do think that the product is a good quality. I did get side effects while first taking this supplement. I got belly pain for the first 2 – 3 days. Stomach aches are never fun but thankfully it went away after a few days. If you have a sensitive stomach, you may want to keep this in mind and ease into it. Yes, GNC Ultra 25 Probiotic Complex has a 30-day 100% satisfaction guarantee. If you aren’t happy with the supplement for any reason, you can return within 30 days and get a full refund. I really like when companies can back their products up with a satisfaction guarantee. To buy GNC Ultra 25 Probiotic Complex, click here. Allergy Concerns No allergy concerns.